Daily Illuminator: You Can't Be A Road Warrior Without Road! February 18, 2013: You Can't Be A Road Warrior Without Road! I'm not sure why everyone says that road construction is so difficult; when you need some new road sections, why not just fire up the printer? Maybe all the city governments of the world should just buy copies of Car Wars Expansion Set 1 - Road Sections and Counters. This classic Car Wars supplement (newly released to e23) lets you take your classic post-apocalyptic four-wheel firefights to new avenues -- literally! In addition to containing the original oversized pages (for those fortunate enough to own gargantuan printers), this PDF also includes reformatted versions of those big sheets to fit standard sizes. 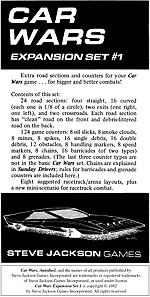 Forget dealing with asphalt and tar; now all you need to build your own Car Wars roads is toner or ink and some paper!